The Work of Wolfgang Laib invokes a natural clearness and wholesomeness by aspiring to a cosmic healing through his rigorously self-disciplined and morally ecological humility. Inspired by Eastern spiritualism, it is no surprise to see Laib employ the words of Persian poet Rumi in From The Cup of Your Divine Love My Soul Is Swimming and Dissolved is All Earthliness of My Body – Rumi, a quote reminiscent of Laib’s ideals. 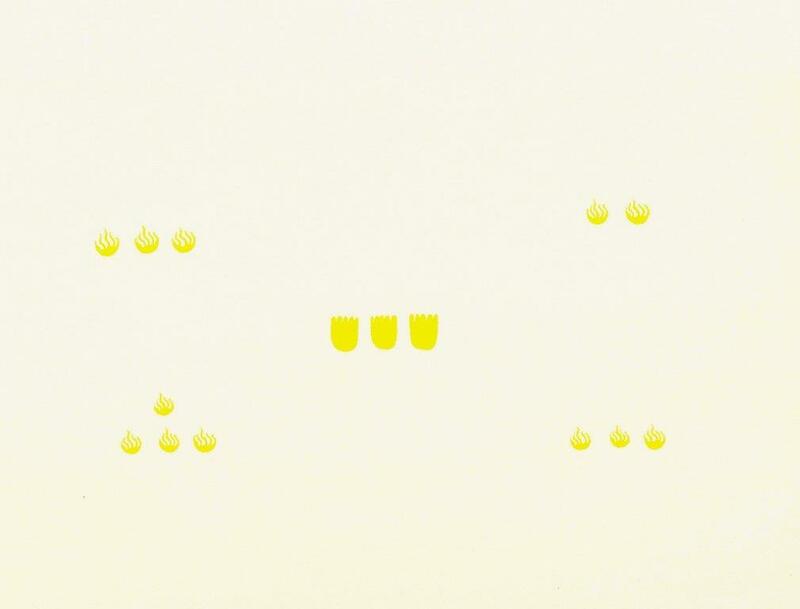 In this work he utilizes yellow (similar to the color of his iconic pollen works), to illustrate Rumi’s prose as the three understated cups in the center are surrounded by fire symbols, perhaps representing the soul. Wolfgang Laib’s retrospective organized by the American Federation of the Arts traveled to the Hirshhorn Museum and Sculpture Garden, Washington DC; Henry Art Gallery, Seattle; Dallas Museum of Art; Scottsdale Museum of Contemporary Art; Museum of Contemporary Art, San Diego; and Haus der Kunst, Munich. Other recent solo exhibitions have been held at the Guangdong Museum of Art, Guangzhou; Fondation Beyeler, Basel; Museo Universitario Arte Contemporáneo, Mexico City; The Nelson-Atkins Museum of Art, Kansas City ; and MMK Museum für Moderne Kunst, Frankfurt. Laib’s work is in private and public collections worldwide, including Museum of Contemporary Art, Los Angeles; Museum of Modern Art, New York; Centre Georges Pompidou, Paris; CAPC (Musée d’art contemporain de Bordeaux); Kunstmuseum Bonn; and Museum of Contemporary Art, Helsinki.